The design/build team of DPR Construction, SmithGroup and Forell/Elsesser Engineers has completed construction of the Ray and Dagmar Dolby Regeneration Medicine Building for the University of California, San Francisco. Schematic architectural design was provided by Rafael Viñoly Architects of New York City and structural engineer Nabih Youssef & Associates of San Francisco. Located on the university’s Parnassus campus in San Francisco, the new $123-million building houses the Eli and Edythe Broad Center of Regeneration Medicine and Stem Cell Research at UCSF. Supported by funding from the California Institute for Regenerative Medicine (CIRM) and private donations, the new facility is considered a significant milestone in the history of UCSF’s pioneering stem cell research program. 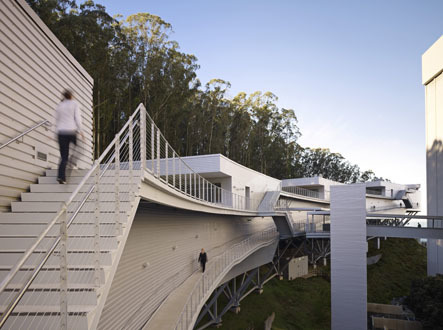 Located on a steep hillside of the urban campus , the 660-foot-long Ray and Dagmar Dolby Regeneration Medicine Building has a serpentine-like design and sits on a structural framework 40 to 70 feet off the ground. The building, which is targeting LEED Gold certification, features base isolators that allow 23”inches of lateral movement during an earthquake. This is achieved by earthquake isolation devices, some of which were custom designed by Forell/Elsesser the structural engineer, to withstand unique uplift forces, positioned between the foundation and structural steel bracing that supports the building. The design/build team was awarded the design and construction on the new research lab in June2008 with a mandate from the CIRM that the building achieve beneficial occupancy within two years of the award. To fast-track the design and construction, DPR, SmithGroup the architect of record, and Forell/Elsesser, used Integrated Project Delivery (IPD), a collaborative process that optimizes results, reduces waste, maximizes efficiency and increases value to the owner. The team also utilized an innovative document production system and an incremental permitting process. Numerous design solutions were implemented on-site, with university representatives playing a major role on a daily basis to assist with input and feedback on the construction. “This process produced an intensely innovative, fluid, and rapid response, to a string of seemingly insurmountable challenges. The investment of each team member shows in the execution of every detail and the overall result,” said Marianne O’Brien, AIA, Project Manager for SmithGroup. In addition to site and schedule hurdles, the team was challenged to find significant cost savings while remaining true to the original design and intent of the building. This was achieved by reclassifying the building from a hazardous occupancy to a business (“B”) occupancy by applying the newly adopted building code. The team also removed a mechanical level originally designed to hang from the underside of the building and embedded it into the office level. This change eliminated fire and smoke dampers and increased the net to gross square foot ratio. The original design of the superstructure required expensive “falsework” during erection that would have interfered with the scheduling of other construction work. The design build team redesigned the superstructure of the building to include additional vertical columns, which reduced shoring and helped the schedule.